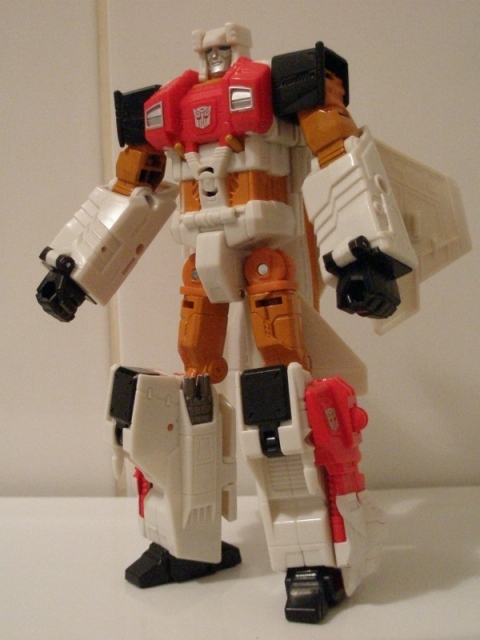 Bio: The leader of the Aerialbots forms the core of the team's combined form, Superion, a single- minded form bent only on Decepticon destruction. Bio: Scared of heights, Silverbolt is nevertheless a brave, grimly determined warrior, whom struggles to maintain that image in order to hide his phobia. Selected by Optimus Prime to command so he'd be too busy worrying about others to worry about himself. In jet Mode, he has a speed of Mach 1.9 and a range of 4500 miles. Carries electrostatic battery that releases bolt of up to 150,000 volts through his nose cone. Uses electrostatic discharger rifle in robot Mode. 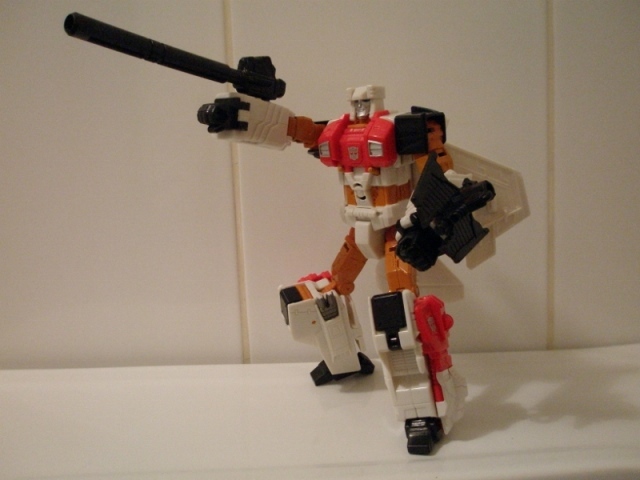 Combines with the other Aerialbots to form "Superion". I love the old profiles Transforrmers used to get. Shame no one can be arsed these days. So, yes. Silverbolt then. Stoic leader of the Aerialbots, afraid of heights and turns into an aeroplane. And leads a team of similar. Do you see what they did there? 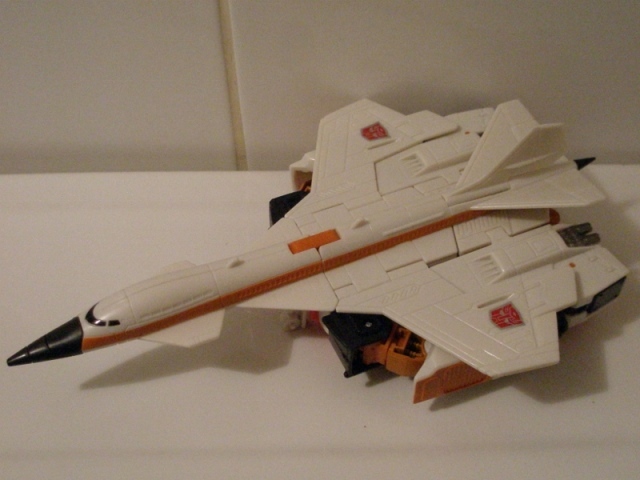 In terms of inappropriate alt modes, Silverbolt is up there with the similarly airsick Broadside. Such neurosis defined a lot of the early Transformers and whilst that might seem lazy, it does give you a handle on the character straight away. What they're like, how they might behave and all that. 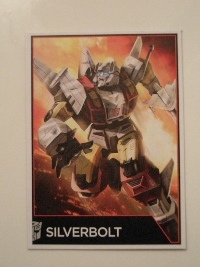 For old Silverbolt, here, it never really engendered 'must have' about him though, as for some reason the Aerialbots seemed the least interesting merge group. Maybe its because there's no variety in them. They were just 'the Autobot jet guys' and nothing more. There's just something about these new Combiner Wars re-imaginings that's really grabbed my attention. They've suddenly made the Aerialbots interesting. 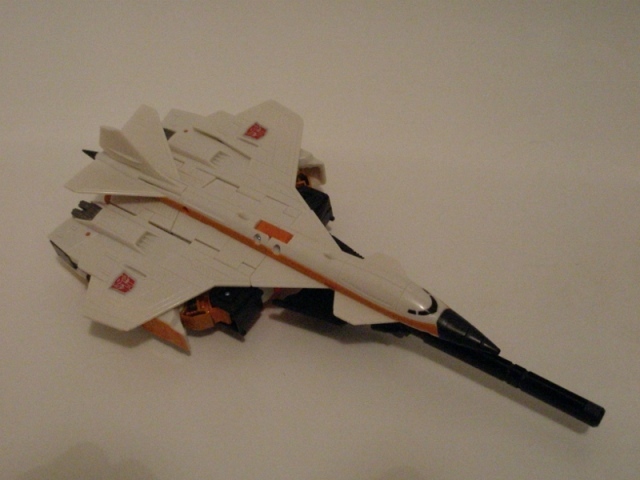 Robot Mode: Silverbolt is a great big block of a thing. He's chunky, quite hefty and has a pleasing weight to him. He's got these nice solid limbs and some tough ratchet joints, so makes lots of staisfying clickety-clackety noises when you move him about. Design-wise, he's a good riff on the Sunbow model sheet without being slavishly so. It's like the designers have used this as a template, but known when to rein it in to make the toy work, which is brilliant. It means you have a toy that doesn't feel compromised in the same way some other homage toys do. I like that he's made up of all these great tactile wedges – his arms are these great serrated blocks and his legs are these chopped out triangles. Whilst these touches make him great to handle, they do conspire to make him an ugly looking thing. His forearms are unusually massive and the lower legs have that same clumsiness of the old Cybertron-era tetra-jets, with the tiny feet failing to balance out the huge knee pads. His torso is possibly a tad too straight and flat too, but I do like the red chest plate with its handsome silver insignia. He's topped off with a nice headsculpt that looks friendly, yet stern. Some minor quibbles about his proportions aside, the only major flaw he has is having his entire alt mode tucked away on his back – and on my example, some poorly applied paint. His weapon is a silly looking thing. It looks like he's waving a drainpipe around. It splits in two with the winged part forming a shield, but this really doesn't improve things. Alternate Mode: An approximation of the old Concorde design, Silverbolt is a supersonic jet which is a a very slick, aerodynamic dart. So it's no surprise that the figure has struggled with the limited mass of Concorde and has his entire robot mode just folded up underneath. It's not great, truth be told, and for a modern figure feels like a huge backward step from the engineering leaps and bounds of 2010's Terradive toy. That said, he does look pretty decent, despite his arms and everything being visible beneath the wings. Plus, its no worse than the original, or his old Univese toy. His colours are quite nice, just being this lovely cream white with custard powder stripes. He has some fold down landing gear and you can slap the drainpipe gun under the cockpit for the usual daft looking attack mode.